The first thing you must do is figure out if the entity has given this spinout a lot of thought or is this just an idea? To find out you must get their answers to 11 questions. You are trying to figure out the level of depth in their thought process—is it cursory or at a grand level of depth? The Problem: What is the business problem that a NewCo would use this IP to solve? The Solution: How does the IP solve the problem? The Value: How much impact would the solution have on a company’s cost savings or increased productivity or increased security etc. The Market Size: How big is the market for the solution? The Timing: Why is now a good time for this type of solution? The Proof: What proof/milestones have been achieved that prove there is a market for the solution? The Plan: What does the entity see as NewCo’s strategy for taking the solution to market? The Competition: Who else is out there selling a similar solution? How well are they doing? What does this IP have that others are missing? The Obstacles: What obstacles would be in the way of NewCo’s success? The Team: What team members would go with the IP (if any at all)? The Financial Model: How much cost would it take to build a NewCo and how much value could it return over what time frame? If the entity is experienced and has sold or licensed IP in the past, or has funded companies as subsidiaries or new entities previously, they likely have thought through these 11 items in quite a bit of detail and understand the value of their asset and who in the market is the likely ‘acquirers of’ / ’investors in’ such an asset. If not, then there is market-analysis work to do first to determine if this exercise is an event worth the energy. The second thing you must do is understand ‘why’–the Motivation. 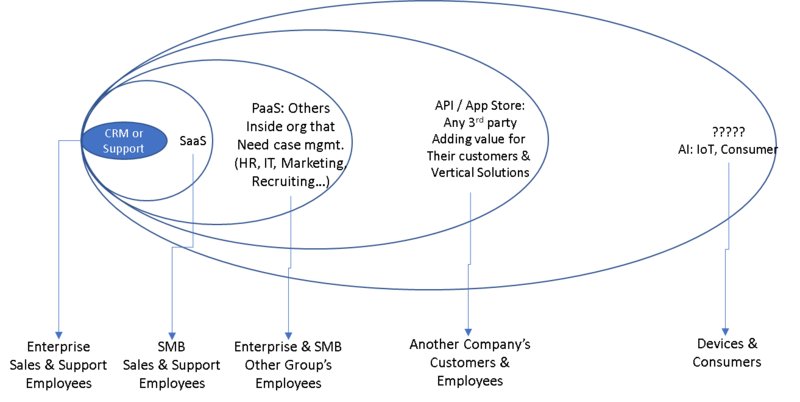 Why would the entity spinout IP versus capitalizing on its value? It’s easy to understand why a university or government would spin tech out (they can’t capitalize on it easily) but for a corporation to do it, there must be a good reason. Is it easier and cheaper for R&D to be done outside the company? Is it a deviation from corporate priorities (example: we do R&D for the government)? It’s used internally with great value, but the tech would have even more value to the entity if thousands of other companies were using it as well. It’s important to understand the underlying motivations so you can begin to understand the dynamics of the situation. The third item to figure out is if the entity has an expectation of value? Some entities have divested of a lot of IP in the past and for others, this may be the first time. You must figure out if the entity’s expectations are reasonable. Last, does the entity have a business model in mind? Do they just want to sell the IP to a buyer, or do they want to fund a startup? …or is the answer somewhere in between (license the technology to NewCo for a % of sales as one example). You must figure out if they want a short or long-term return, and do they understand the ramifications (additional investment may be required; legal fees etc.). Let’s go a little deeper into item 1 above as it will begin to shape the entire conversation with the entity. What category does this IP fit in, regarding the tech ecosystem? A great place to start is Crunchbase. As an example, let’s say that the IP in question helps the entity’s corporate employees communicate better on tasks, in and between, corporate silos. You dig into CrunchBase and find 475 companies competing in the ‘Task Management’ category and another 2,400 competing in the ‘Collaboration’ category and 108 companies with both. Obviously, there are many solutions in each of these sub-categories solving different aspects of collaboration for different audiences and there is a lot of overlap, so the sub-categories are difficult to navigate but you can ascertain there is a great deal of competition in each of the collaboration submarkets. Are there market leaders leveraging similar IP? One easy way to tell is if Gartner, Forrester, IDC or another large trusted enterprise research organizations has created a market guide. If we take our task management example a bit further, we might see a few big horizontal areas where the tech is applicable (possibly Project Management, CRM and IT Service Management) and who some of the dominant players in the market are today. 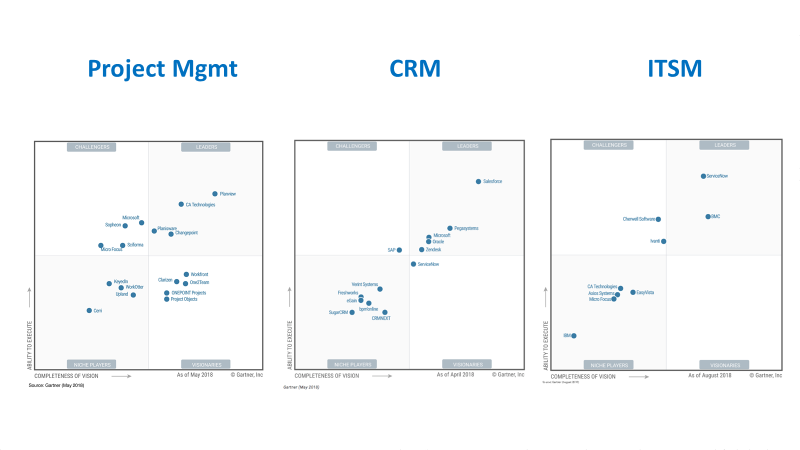 Gartner does a nice job of showing this in something they call a magic quadrant. 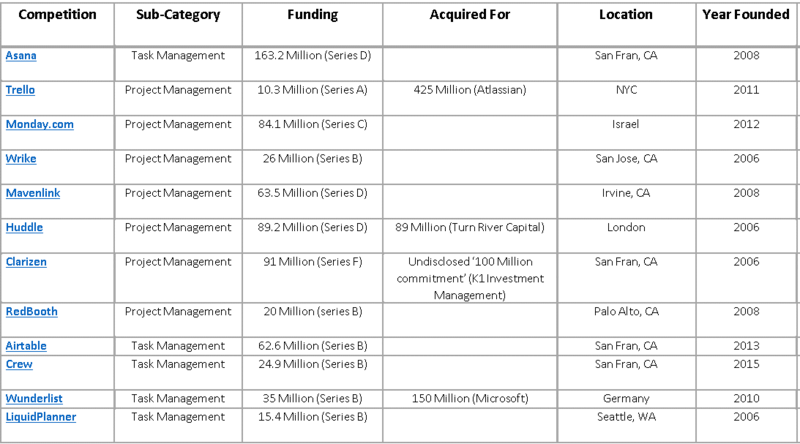 You can also build some market reference points on these leaders. For example, ServiceNow finished 2018 with about $2.8 billion in annual revenue (and Q2 revenue was up 45%) and Salesforce increased its market share in 2017 by more percentage points than the rest of the top twenty CRM vendors combined. If enterprise solutions are being sold with similar IP you can generally get access to market size data that the Enterprise Research Analysts have published—it might cost you a Gartner subscription but there is great value in the research. Who are the new market challengers that are doing something with similar IP? Every space is being disintermediated in some way, shape or form so you need to understand how the market where your IP fits is changing and how much is being invested in the changing landscape. With our example, you will see that companies like Asana and Trello are having a major impact on the future of the space. You can also see that a great deal of funding is going into these new platforms from well-known venture capital companies. You can find all this data at no-cost in Crunchbase. Looking at both market leaders and challengers will help you start to understand the ‘problems’ being solved, the ‘solutions’ being used/sold, the ‘value’ being created, and the ‘pricing’ being used by similar IP in the market. Are there changes on the horizon for the future of the markets where this IP fits? Once you dig into the enterprise plays and compare the market-challengers you will soon see if any patterns emerge. This could start to provide you a view into ‘timing’ and market adoption and will allow you to determine if your IP is too old or is it perfectly timed for where the market is going to be in a few years. This will also help you to start formulating some of the obstacles with the IP. If we continue with our same task management example, you will see that the market is moving toward platforms that enable many solutions that are tightly integrated. The market has coined the term Platform-as-a-Serve (PaaS) for the shift. 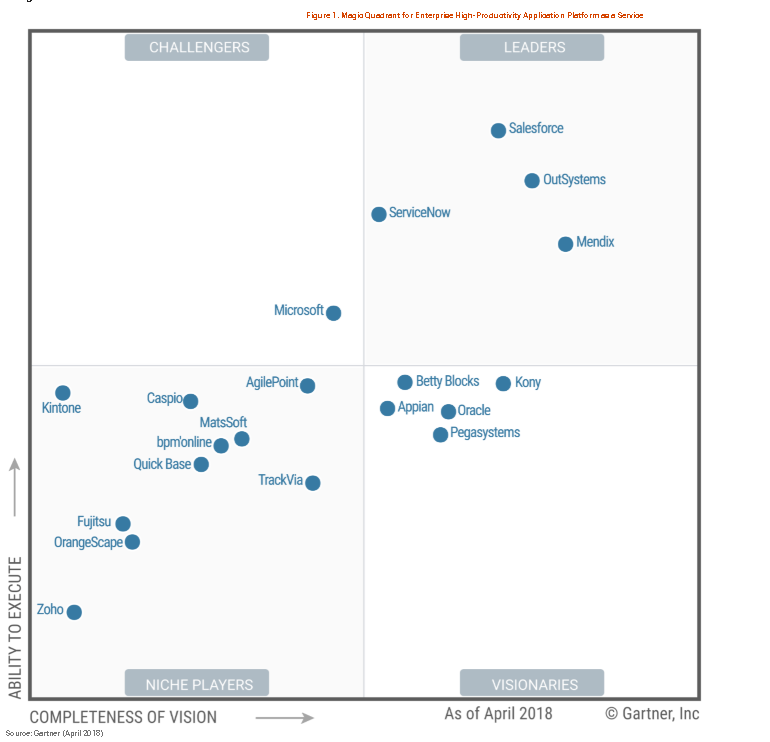 Gartner even has a magic quadrant referencing the platform enablers for the shift. And if you dig into the market challengers to this platform shift you will additionally find all the Function-as-a-Service (FaaS) or Serverless discussions. Timing. As a new company, if you are late to the market, you will likely lose. Only fast followers that differentiate primarily based on a superior cost structure due to scale can win as a follower. If you follow Pete Flint’s NfX model for startup timing “it’s all about who enters the market closest to the critical mass point. It’s at this point when technology, economic and cultural forces can combine to enable explosive growth”. 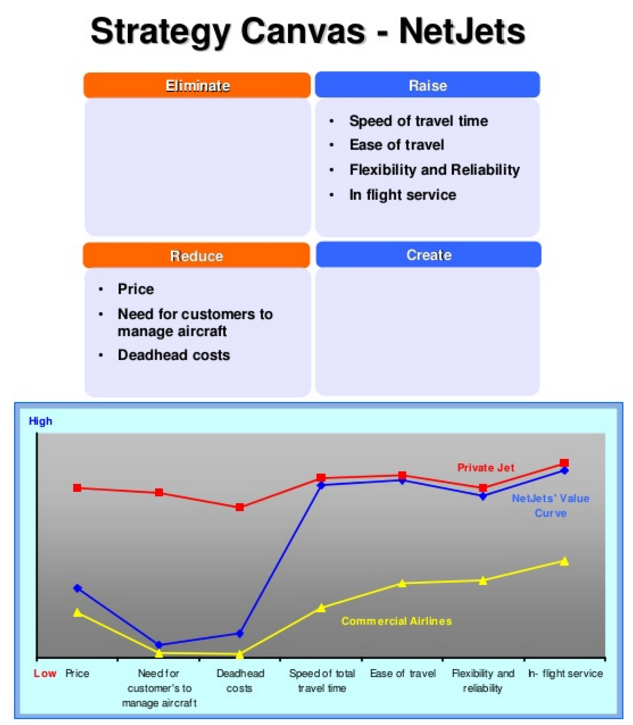 With our task management example, given the onset of FaaS and current enterprise companies already fully entrenched in PaaS the IP would have to already be written with FaaS in mind to have a chance at competing with the momentum of the challengers or the entrenchment of the enterprise PaaS solution….or the idea would have to be so unique that a rewrite of the code would be worth the effort/cost. Who is using the IP today? Is there or can there be a detailed case study written? Can the value be quantified with the current use case? Have others seen, requested or been given access to the IP and what is their feedback? How much has been invested to build the current IP (in dollars and time)? How big was the team? What are the skills of each of the people on the team? When was the IP last updated? How well is the IP documented? Are there patents from the company or others that infringe on the IP (you must do a patent review prior to next steps—do a preliminary review here). Is the current IP part of a Continuous Delivery process and is it well documented? What languages were used to build the IP? What open-source libraries? What are the licenses of each of those libraries? Has an inventory of the code been documented by a group such as Black Duck? Are there any proprietary libraries being leveraged that lock the IP into a certain platform (such as AWS)? With our task management example, the code is being used by the entity so there is a great deal of information that can be gathered and used. The code also would come with its first customer (the entity). If the entity isn’t willing to continue to be the first customer then this may be a warning sign and should be discussed. Plan. 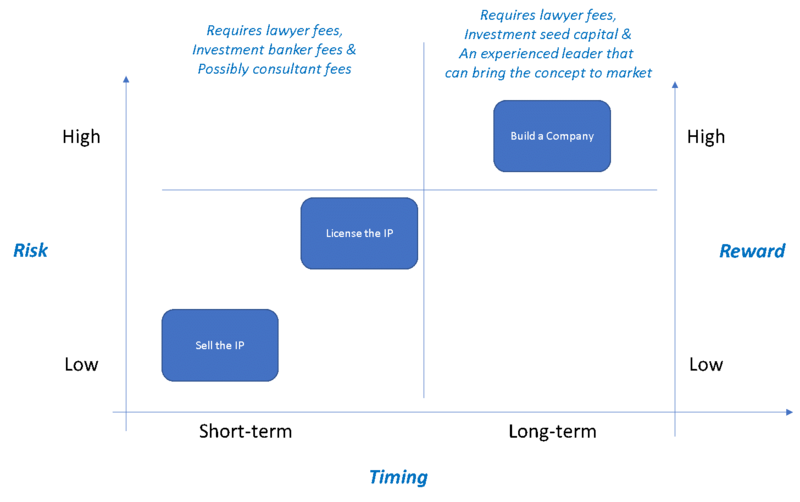 What strategies are potentially applicable to build a company around the IP? 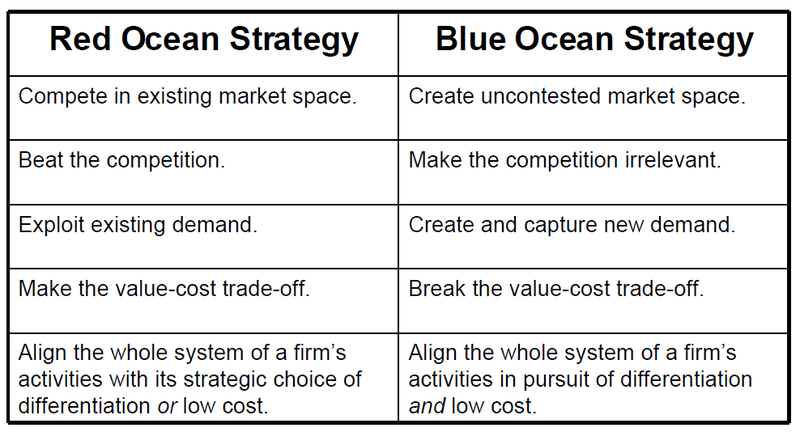 An easy way to start digging into opportunities for different strategies is to leverage the “Blue Ocean Strategy” and to dig into different uncontested markets for the IP. Are there areas in the market that are uncontested, and the IP is a perfect fit? You also have to know how the IP lines up with a Lean Startup Minimum Viable Product (MVP) for the uncontested market and how long it will be until the IP is read to put in front of customers to test assumptions. This is critical for early decision making. With our previous example, it’s difficult to find uncontested space given how big the entrenched players are and how much energy (VC $) is going into the hundreds of challengers. There may be a play for AI, IoT or Consumers—and then again, there may be an uncontested space that’s not well understood still available. Team. How big was the team that built the IP? What are the skills of each of the people on the team? Where are they located? How are they compensated? What are they doing now? Are any of the people that built the IP willing to move with the IP? Financial Model. Given most IP today is delivered via the Cloud it would be good to have some idea of the cost of building such a company. The spreadsheet outlined in this post by Gary Gaspar (and in the comments) is good enough to start getting a handle on what it would likely cost to get such a company testing the uncontested spaces you found previously. At the end of the day, the more you know about the market for the IP and the opportunities the better decision you will make about what to do with it in the market. However, never forget the golden rule: Building a company is NEVER about the idea… and it’s not about the plan… It’s ALL about the team and how the plan is Executed!